Maricopa Sheriff Joe Arpaio Loses Re-election Fight : The Two-Way Democrat Paul Penzone, a former sergeant with the Phoenix Police Department, defeated the controversial Arizona lawman by nearly 10 percentage points after building a substantial lead in the polls. Former police Sgt. Paul Penzone, a Democrat, will be the new sheriff of Maricopa County, Ariz., after beating longtime incumbent Joe Arpaio. Democrat Paul Penzone has ended controversial Arizona lawman Joe Arpaio's 24-year tenure as the sheriff of Maricopa County. Arpaio has faced multiple legal challenges to his stance on immigration; the loss comes despite raising more than $12 million from donors. The defeat ends a run in office that began the same year Bill Clinton first won the presidency. It comes two weeks after Arpaio, 84, was charged with criminal contempt of court for ignoring a federal judge's order in a racial profiling case. Penzone, a former sergeant in the Phoenix Police Department, defeated Arpaio by nearly 10 percentage points after building a substantial lead in the polls. The challenger's backers included liberal billionaire George Soros, who donated more than $2 million to the effort to oust Arpaio. 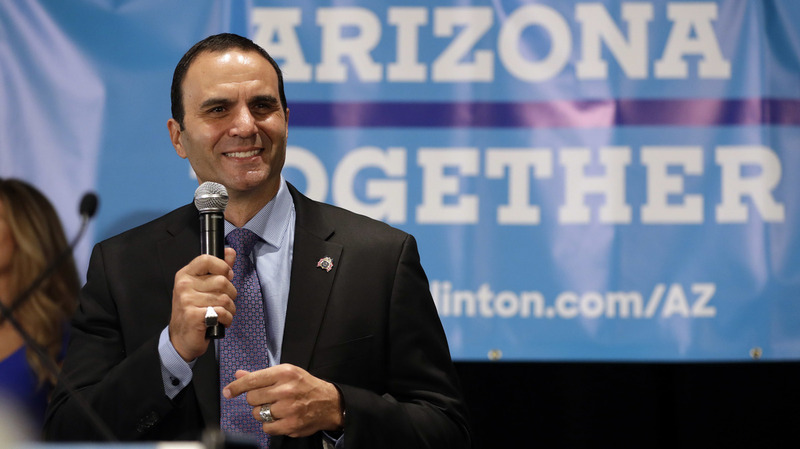 "Arizona stands for something greater, no matter where we come from or what we look like, we are all entitled to respect," Penzone said, according to member station KJZZ. At Penzone's victory party, KJZZ says, supporters took up a chant: "New sheriff in town." Arpaio's exit comes after he rose to fame for his reputation as the toughest sheriff in America. His hard-line views on immigration helped him form an alliance with President-elect Donald Trump and boost fundraising. But among many of his constituents, Arpaio's legal troubles were seen as an expensive distraction. In September, Maricopa County agreed to pay $4.5 million in legal fees to the plaintiffs in the case, which dates from 2007. That payment was added to some $10.4 million that had already been paid, as AZ Central reported.